I want to say that Lucasarts made me love videogames, but that’s not true. I do think I learned to love them more deeply thanks to Lucasarts. Here’s my most cherished memories with their games. The Finnish review in MikroBitti was great, recalling slasher flicks and painting it quite a bit more macabre than it really was. 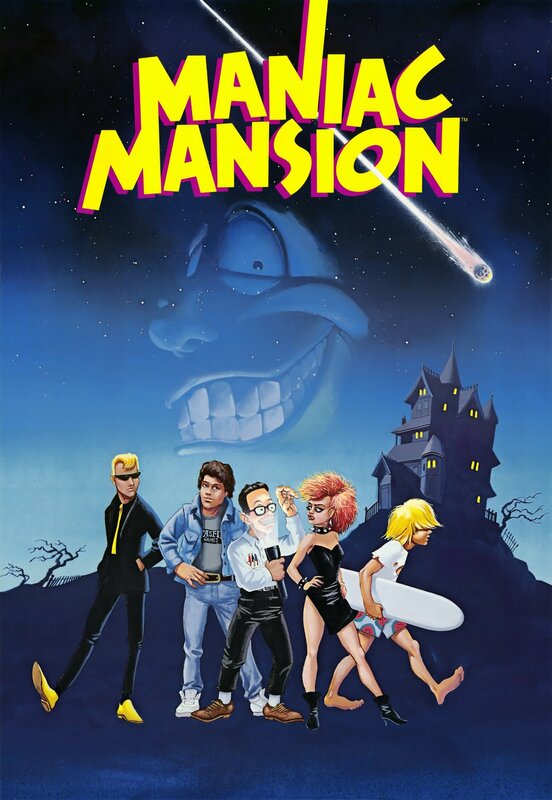 Maniac Mansion still feels progressive with its choose your own cast mechanics and dynamic NPCs. Rarely has so much been attained with such a limited playspace. Zak always felt like Lucasarts’ most ambitious game to me. I’m not sure how complicated it actually was, but it felt like a very big game with lots of paths you could go down. Its mix of the mundane with the surreal and the fantastic remains fresh. What a lovely oddball world and cast. From airline pranks to the Sphinx and two-headed squirrels to alien invaders, the cover perfectly covered the atmosphere. I can’t actually recall all that much about LOOM save for realizing that I either have no ear for tone or the friend I was playing with was so much better that it didn’t matter. For a long time I thought that this is the only way you should do a movie license, honoring the characters and the plot of the original. The accomplishment here is following the original story very closely, yet creating enough new stuff to make the game feel fresh. I still don’t think you could do a straight movie adaptation better than this – generally I’d rather you take the route The Walking Dead did, retelling the same kind of story, but not the same one. I bought so wholesale into the brilliantly realized Monkey Island fantasy, going to the Pirates of the Caribbean ride in Disneyland last year felt like coming home for the very same flavor of Caribbean fantasy world they offer. The games feature some brilliant characters and unforgettable scenes – breaking into the mansion, the coffin ride, the voodoo priestess, the drowning… Monkey Island 2 was a big game for me just for looking so unbelievably good, I had a hard time believing it was real. At least until you got to the disc-swapping. I love Grim Fandango mostly for its esthetic values. Very few early 3D games can stand up to light today, but with its sense of style and adaptation of real-world art, Grim Fandango is a masterclass in art direction. It doesn’t overshadow its qualities in writing and characters at all – this is a dance you should learn, even if the very strange world it depicts may be a little much to get your head around at first brush. I don’t actually have that strong memories of this title, but it was one of the best games on the original Xbox and something that’s often overlooked, so I want to bring it up. A turn-based tactical gladiator title, it was never going to be a big seller, no matter how good it was. Without doing the research I can’t be sure, but I believe it was Lucasarts’ last truly good game.